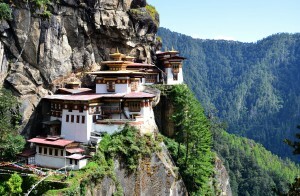 Towards the north of Paro town, clinging from a cliff 3,000 feet high, stands Taktsang – the most famous monastery in Bhutan. Taktsang literally means “Tiger’s nest.” Legend has it that in the early eighth century Guru Padma Sambhava flew from Tibet on a back of a tigress to the place where the monastery stands today. He then meditated there for three months in a cave. Guru Padma Sambhava is known for introducing Buddhism in Bhutan. The monastery was constructed in 1684 by Paro Penlop, Desi Tenzin Rabgye. In 1998, t the monastery was destroyed by a fire but was restored. The monastery had suffered fire previously in 1951. The monastery has seven temples clustered around the cave where Guru meditated. It is three hours hike uphill from the road point. The trail climbs through a beautiful pine forest. The view of Paro valley from Taktsang is breathtaking.